Halloween is just around the corner, which means there will be a lot of candy, costumes and decorations in sight. Your children may love this time of the year, but your four-legged friend may not have as much fun. If you choose to dress up your dog for Halloween, try to stay clear of complicated costumes that include several pieces of loose fabric. Your pup will be tempted to chew off the objects which can result in digestive upset. 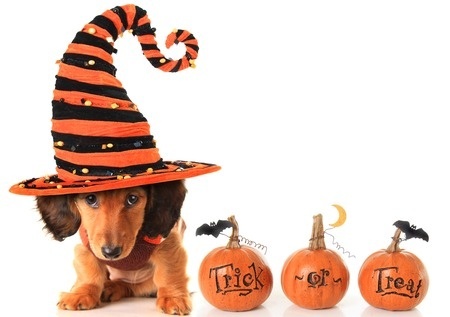 Dangling pieces of costumes can also trip your pet and they can get tangled on furniture or in closing doors. When you decorate your house this Halloween, keep your dog in mind. Fake spider web material can ruin your pet’s stomach or intestines if they eat it. If you have pumpkins out for show, be sure to keep an eye on them. Spoiling pumpkins can lead to digestive issues as well. If you choose to place candles in the pumpkins, be careful not to let your pets around them. Your pup might get excited and accidently knock them over. Chocolate tends to be a very common Halloween pet hazard since it’s problematic to dogs. Keep all chocolate safely out of reach of your pets this Halloween and any candy for that matter. Ingested candy wrappers can also lead to digestive problems, which could result in an unplanned trip to the vet. With a little bit of awareness, Halloween can be a fun time for the whole family – including your dog! If you’re looking for a pooch or want to learn more about the toy and small dog breeds we have for sale, contact Pauley’s Pups today by calling 804-798-7877. We look forward to speaking with you. Have a safe and fun Halloween!